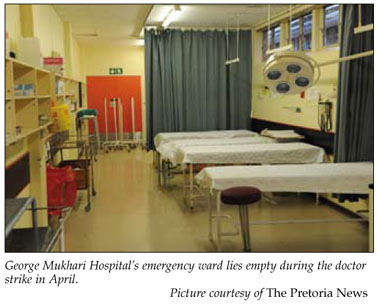 Doctor ignorance of legal strike requirements coupled with an infuriating and way overdue salary hike had a lethal outcome in April  two pregnant mothers and one of their infants died in strike-hit public hospitals. All three deaths, a mother and one of her twins at the Odi Primary health care centre near Pretoria and a woman whose uterus ruptured at the Mafikeng Hospital, happened during a 'go slow' and a wildcat (unprotected) strike by doctors at these respective institutions. The illicit industrial action ran from 16 to 28 April, when the remaining strikers agreed to return to work and use recognised bargaining channels in future in return for the downgrading of their dismissal notices to final written warnings. The labour court on 24 April granted the Gauteng health department an interdict against their doctors striking during formal negotiations. SAMA's angry representatives refused to rule out future strike action if the 'intransigence and delays' by the health department's negotiators continued unabated and led to a formal dispute. The DoH narrowly averted a legal strike by meeting an agreed 29 April deadline for tabling new pay schedules on the controversial and long-overdue Occupation-Specific Dispensation (OSD), claiming SAMA's back-payment demands were 'budget breaking'. Dr Phopi Ramathuba, deputy chairperson of SAMA's public sector committee, who initially distanced herself from the wildcat strike, warned that failure to speedily bring doctors' salaries closer to other State professionals' income (50 - 75% higher) could lead to a devastating surge of emigration overseas and/or to the private sector. 'If this government cared about its own people, they would be worried about the number of doctors who've left since July 2008 (the original OSD implementation date) and 172-bed hospitals managed by just two doctors when they have 30 doctor posts,' she said. She said the health department and the Health Professions Council of South Africa (HPCSA) were quick to threaten or punish doctors when they fought for salaries enabling them to deliver essential and professional services, but did little to help them deliver these. 'Before they talk about court orders let them deal with issues like (the DoH) refusing to sign a minimum service level agreement with us, the lack of vital equipment and the HPCSA nailing doctors when two of them carry out an operation that requires four  risking their careers to save a life. The HPCSA is supposed to protect patients but selectively turns a blind eye on government. Some State hospitals routinely run illegally by failing to meet minimum service levels,' she added. The new DoH offer proposes pay hikes starting at between 0.02 - 5% in the first year, rising to between 18% and 22% in the second year with top-up increases thereafter. Details of the ensuing 'top ups' and back payments to July 2008 were unclear at the time of going to press but interns were not included in either set of proposed pay schedules. Ramathuba declared her negotiating team unhappy with the new offer and said SAMA's private consultants were costing it before member input was gathered and demands were retabled. The department 'must know we won't stop anyone from striking again if they don't agree. If the Hippocratic Oath doesn't affect me when I move overseas or to the private sector, why must it affect me when I strike? Working conditions are not just about doctors, they're about the patient environment. They must rather dismiss all 14 000 public sector doctors, all of whom will strike if SAMA leads. How much are those people who are telling us not to strike earning?' she asked. 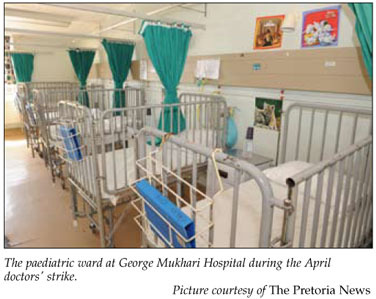 The April wildcat strike spread from the Medunsa-linked George Mukhari Tertiary Hospital in the Tshwane Metropole (over 300 doctors comprising over 80% of staff complement) and Mafikeng Hospital (50 doctors), to other major hospitals in Gauteng, the Free State and Limpopo. George Mukhari and Jubilee hospitals held out the longest. It could not be established if there were any further deaths among the thousands of patients whose care was compromised. Consultants conducted solo ward rounds, already stretched nurses staffed ICUs and high care facilities and ambulances were diverted. Admissions and 'walk-ins' were referred to non-striking hospitals or given follow-up appointment dates. An HPCSA spokesperson said they had received no complaints at the time the SAMJ went to press but promised to 'immediately investigate' should any health departments provide a duty roster in the relevant mortality cases. The national health department said the striking doctors, 'owe the nation an explanation for their conduct'. SAMA promised to defend any members who might face professional conduct enquiries in spite of the 'premature' and unprotected strike having severely embarrassed them at the negotiating table. SAMA also launched a patient and doctor damage-control exercise, appealing to the national public works and health ministers and their deputies to intervene with Gauteng and North West Province health authorities to prevent the imminent mass firings of doctors and the subsequent collapse of affected hospitals. Izindaba estimates that at least a fifth of the 6 000 public sector members of SAMA heeded the strike call by the disaffected and newly formed 'Forum of Doctors for the Occupation-Specific Dispensation (OSD)'. Participants were mainly juniors, consisting of interns, community service doctors and medical officers but a significant number of registrars and some consultants joined. The juniors were incensed at being ignored in the health department's first tabling of its OSD salary schedules. The disaffected 'Forum' grew out of cell phone 'Mix It' and Face Book networking that quickly mushroomed across four provinces with many seniors bemoaning what one termed 'disrespect and undue pressure' exercised by some strikers. Professor Sam Monokoane, head of Obstetrics and Gynaecology at Medunsa, said it could, 'never be right to abandon patients and put their lives at risk'. He and his fellow consultants managed to avoid any maternal or fetal deaths at George Mukhari, 'rising to the challenge and performing caesarian sections on an emergency basis'. care was compromised. No doctors were monitoring patients in the labour ward, ICU and renal unit. The antenatal clinic was cancelled, while Pretoria Academic and Kalafong hospitals were flooded with patients turned away by us,' he said. Monokoane noted that with isolated strikes, 'frustration levels just go somewhere else', but added 'we lay the blame squarely on government. They've failed our doctors and failed the public. There is a basic incompetence and lack of will to effect what is good for our society'. Across the board State doctors face a volatile mix of harsh working conditions, faulty and missing vital equipment, long working hours, staff shortages, salaries way below equivalent public sector professions and 'lunatic' salary anomalies within the sector itself. Many see their bureaucratic support staff as often incompetent, unhelpful and sometimes even hostile. This provided the gunpowder for what irritated SAMA negotiators initially saw as the 'trigger happy' forum. How to lever seemingly endless prevarication? The sparks were SAMA's cancellation of an eagerly awaited protest march on 16 April in support of its demands at the Public Service Co-ordinated Bargaining Council (PSCBC) and the prior distribution of the first salary schedules the DoH tabled. The irony was that the health department had just speeded up the tabling of an 'improved' offer to a week earlier than SAMA's 29 April deadline, accepted 'stand-alone' negotiations with public sector health care unions and agreed in principle to backdating increases to July 2008 (pending negotiations on phased implementation because of budgetary constraints). The department's human resources chief, Dr Percy Mahlati (a former SAMA Secretary General), publicly committed his department to the 29 April deadline, bemoaning the 'unprofessional conduct' of the striking doctors and their lack of industrial relations nous. Muthei Dombo, a leading figure in SAMA's 'OSD Road Show' that toured the country in February, painstakingly outlining the proposed new salary tables to doctors, for once partially agreed with him, as did Ramathuba (both on the lack of IR nous). They confirmed that members had unanimously rejected the first schedules, voting in principle to strike should negotiations fail. However they stressed that this was within the context of proper industrial relations procedure, with SAMA the only legally recognised bargaining representative for doctors. Logistics however forced SAMA to keep putting the protest march date back, eventually to beyond 16 April, a date after which municipalities refused protest march permission because of election pressures. 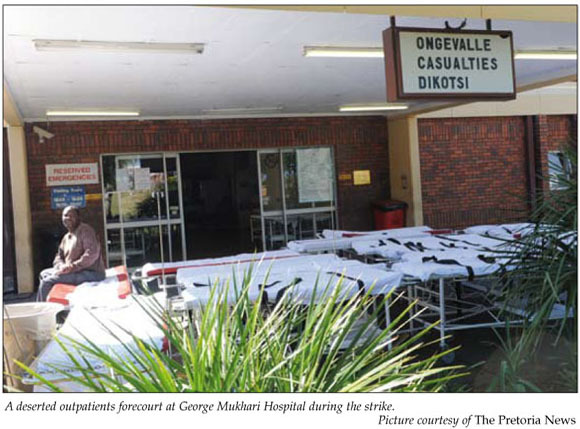 Frustrated doctors at George Mukhari Hospital, denied this avenue of expression, lit the fuse with an initial 'sit in' that rapidly escalated into a full-blown wildcat strike. Mukhari Hospital registrar, Bikwani Siwele, angrily told Izindaba at the time that 'SAMA have dropped us and no longer represent our interests'. Speaking during a picket outside Mukhari's gates, Siwele, who identified himself as the national deputy chairperson of the forum, said that unless the health department dealt directly with them, the strike would continue, regardless of an official notice for them to return to work immediately or face dismissal. 'We took this stance soberly knowing this would come at some stage. Right now our demands have not even been tabled so how can we be intimidated by this notice? We want to see what they table in the bargaining chamber and see if it represents doctors' interests as a whole. SAMA has no right to dictate to us on what we must do, they have failed us,' Siwele added. He told Izindaba at the time that the forum was 'taking legal advice' on their action, a comment that prompted Ramathuba to describe the strike as ill-considered and 'displaying major ignorance of the required procedures'. She was referring to the requirement for the official declaration of a dispute when talks break down and the notice of intention to strike, plus the existence of a minimum service level agreement (MSLA) (or putting in place alternative measures to protect patients). An MSLA is required before essential service employees can strike. This places the onus on doctors to ensure there are processes in place to avoid harm to patients, something that serves the health department  and to which the striking forum took major exception. Cape Town specialist and SAMA's Western Cape Chairperson, Mark Sonderup, who has been involved in salary negotiations with government for several years, said doctors put the MSLA on the PSCBC agenda 'years ago'. 'The employer dragged his feet  so much so that when public servants went on strike in 2007, we declined invitations to join because this wasn't in place. It serves the department's purpose not to have an MSA'. Some nurses earned more than the doctors they worked with after provincial health departments chaotically and erratically introduced the OSD for them in December 2007 (six months late amid tens of millions of rand in overpayments). Departmental officials said much of the doctor OSD delay was because they wanted to avoid a repeat of this drama and were therefore creating national 'implementation norms'. As for the forum, the longer the strike continued, the more furiously they paddled upstream. Appeals to the ANC's Health Desk, other health care unions and even Cosatu resulted in shoulder shrugs and fingers pointed down-river to SAMA and the PSCBC. Finally, they gave up paddling and submitted to the current.